We are pleased to announce today’s publication in EMLO of a fascinating collection of letters, known as the Tixall papers, that centres around the correspondence of two English Catholic families. The inclusion of these letters arose as the result of an invaluable suggestion from Dr Victoria van Hyning, whose doctoral thesis investigated the literary culture of early modern English Augustinian nuns at St Monica’s convent in Louvain and its daughter house, the English convent of Nazareth in Bruges. Image courtesy of the National Portrait Gallery, London. the head of the Tixall estate, had converted on the occasion of his first ambassadorial visit to Spain. Many of the children from both families took religious vows, and it is particularly apt that their correspondence should be made available online in the same week that a workshop entitled Catholic Legacies, 1500–1800: Uncovering Catholic lives and records is scheduled to take place on Wednesday, 16 September, at the Bodleian’s Weston Library. The papers in this workshop will explore Britain’s rich early modern Catholic heritage through archival and material culture sources and the day will include examination of material in the Bodleian collections, as well as from the Vatican Library, the Archives of the Jesuit Province in Britain, the Archives of the Canonesses of the Holy Sepulchre, the Blairs Museum, the British Museum, and Stonyhurst College. Speakers include Adalbert Roth (Vatican Library), Thomas McCoog SJ (Fordham), Hannah Thomas (Durham), Lucy Wooding (KCL), Peter Davidson (Aberdeen), Dora Thornton (British Museum), and Jan Graffius (Stonyhurst College). From 9am–3.30pm attendance is free; booking is essential only for the special display session arranged for 4–5pm. So, should you happen to be in Oxford and would like further information about the workshop, details are available here, while further details concerning the Tixall collection may be found in EMLO on the catalogue’s introductory page. This entry was posted in Uncategorized on September 15, 2015 by Miranda Lewis. An important step was taken at the beginning of this week as the first batch of metadata for a new catalogue — the collection of Bartolomeo Gamba — was moved into the public interface of EMLO. During his lifetime, Gamba worked as director of the Remondini press, as private librarian to Eugène de Beauharnais, and as sub-keeper at the Biblioteca Marciana. By the time of his death in 1841, he had amassed a collection of circa 4,000 manuscript letters to and from eminent early modern Italian scholars, many of whom were alumni of the University of Padua and amongst whom numbered a significant percentage with close connections to Viennese court physicians. 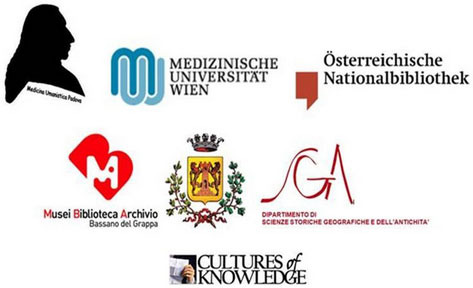 This time last year, EMLO was approached by the historian Vittoria Feola to explore the possibility of working in partnership with the Österreichische Nationalbibliothek in Vienna, the Biblioteca Museo Civico in Bassano del Grappa, and the Biblioteca Nazionale Marciana in Venice to provide a virtual home for this ground-breaking project. Thanks to generous support and funding from both the University of Padua (DiSSGeA) and the Medical University of Vienna, and with a contribution towards scanning costs from Cultures of Knowlege, we are truly delighted now to be releasing the first installment of the collection’s metadata in EMLO. Over the coming weeks and months, letter metadata will be added on a regular basis to this virtual collection, where users will find fully searchable abstracts, keywords, people and places mentioned, and links provided to manuscript images. In the words of our Project Director, Howard Hotson, ‘this is a catalogue with a difference: fresh and original in nature, scope, conception, and execution as well as scholarly and significant in its own right’. Over the coming months we hope you will watch as Gamba’s original collection is reunited. The relevance of such a collection to early modern science and to the Republic of Letters cannot be overestimated, nor can the unique insight it offers into the penetration and workings of the English and French book trade in Northern Italy from the second half of the sixteenth to the first half of the nineteenth centuries. These are exciting times and we hope very much Bartolomeo Gamba’s epistolary trove will be the first of a growing number of erstwhile collections made whole once again in EMLO. This entry was posted in Uncategorized on September 4, 2015 by Miranda Lewis.